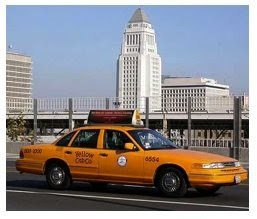 LA's City Council, taking another swing at the hornet's nest, has directed the LA Department of Transportation to work on a plan to soften neighborhood parking prohibitions for taxi cabs. While at first glance it seems like a great and green idea to support our Taxi Cab industry, any revisions to the LA Municipal Code restricting commercial vehicles in neighborhoods surely warrants a thorough analysis and a conversation with the community. The dust from the fray over the City Council's recent revision of parking rates, hours and enforcement has barely settled and they're at it again. All with no Neighborhood Council engagement. We live in a city where 18 wheelers regularly park overnight in violation of prohibitions but the political will for enforcement is lacking. After all, they're engaged in the business of moving goods and that's good for LA! We live in a city where motor-homes get parked on side streets and quiet neighborhoods quickly turn into campgrounds, all in violation of prohibitions. Again, all that's missing is the political will to enforce the code and to tackle homelessness with some real solutions, not a blind eye. We live in a city where detached trailers used for advertising litter the curb lane and clutter the streets, yet our leadership can't find a way to solve the problem. Whether it's respect for the 1st amendment or simply fear of litigation, the community is still left without the support it deserves. It's in this context that the City Council's recent actions to modify neighborhood parking regulations are especially cavalier. It remains to be seen if there is any merit in the proposal. But at a minimum, any proposals should come with the full engagement and participation of the neighborhood councils.